Ralph Castelli, was born and raised in southern California, surrounded by a musically talented family, and by age six became passionate about playing drums. On that momentous night in February, 1964 when The Beatles first appeared on the Ed Sullivan Show, Ralph was hypnotized and knew playing drums was what he was born to do. Captivated by Ringo Starr and The Beatles that night, Ralph’s excitement continued to grow and his dream would eventually become his reality. 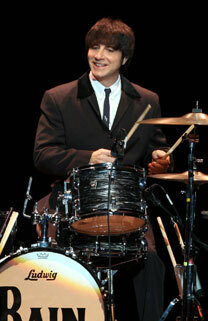 After touring and performing with numerous bands and pursuing his acting career, Ralph landed the role of Ringo Starr in the touring production of Beatlemania and was also cast as Ringo in ”Beatlemania: The Movie.” His talent, drum techniques, humor, style and appearance was in his favor. Ralph joined RAIN in 1986 and is thrilled to be on Broadway.